Wild Things...you made our hearts sing. 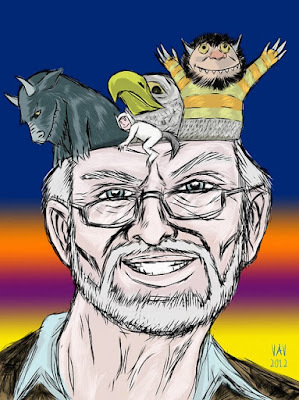 Seems many people have been ruminating on the passing of Maurice Sendak. Here are some of the great tributes that have come my way. Here is one by our very own Vlad. Vlad cooks the books over at the book oven, aka the Espresso Book Machine, aka Ginger. He's also an awesomely talented illustrator, and this week he put pen and heart to paper for this lovely tribute. 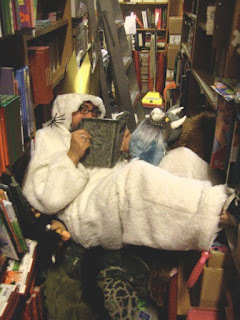 And here's the man himself, making a pretty convincing and mischievous Max, King of the Wild Things. Here's Steve as another would-be Max. 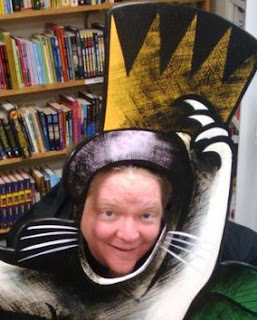 This great Max cut-out lives at Orca Books in Olympia. And last but not least, another great tribute illustration from Third Place customer, Rob Christianson. Beautiful tributes for a beautiful man. Great work, guys!